This has been such a disappointing spring. The two days of 80 degrees over the weekend were nice, but now the rain has started, in preparation for the predicted foot of snow and record cold temperatures expected tomorrow. I’m beginning to think I’m experiencing the same week over and over again. If you ask me (and nobody ever does), I’d rather it be a week of 90 degrees over and over again. But I guess that’s not to going happen any time soon. I spent some time in between naps planting out the dwarf conifers I bought a while back, as well as a few other things, and took some pictures of the little alpine polemoniums blooming in the troughs. These have invariably bloomed in the middle of March, until this year. These are growing in a trough filled mostly with the sky pilot, Polemonium viscosum. 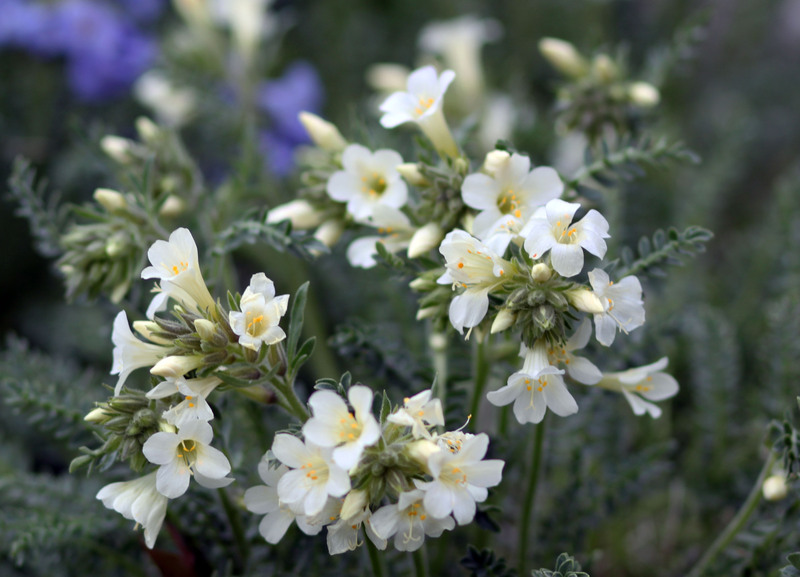 I got Polemonium viscosum from Colorado Alpines in Avon, probably about 25 years ago, either at the nursery there or at a plant sale here in Denver. The P. brandegei came from plants grown by Alan Bradshaw of Alplains, purchased at a plant sale a few years later. Both species have reseeded in the trough, and I noticed one had escaped last year into the rock garden. The troughs are on cinder blocks and so are a couple of feet above the rock garden; I’m surprised that the fall into the rock garden didn’t kill the plant trying to escape. 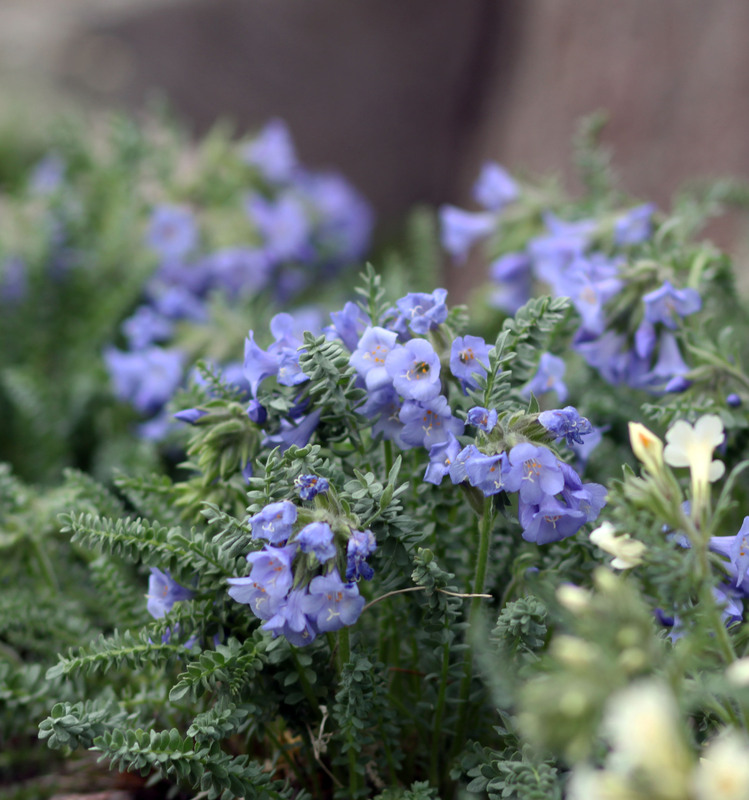 I’ve never seen Polemonium brandegei in the wild, but I have seen P. viscosum, growing quite happily at altitudes of over 11,000 feet on mountain passes, oblivious to snow, high winds, intense sunlight, frost at any time of the year, and other horrors. It’s hard to imagine a more terrible climate in which to grow. No wonder they like my garden. 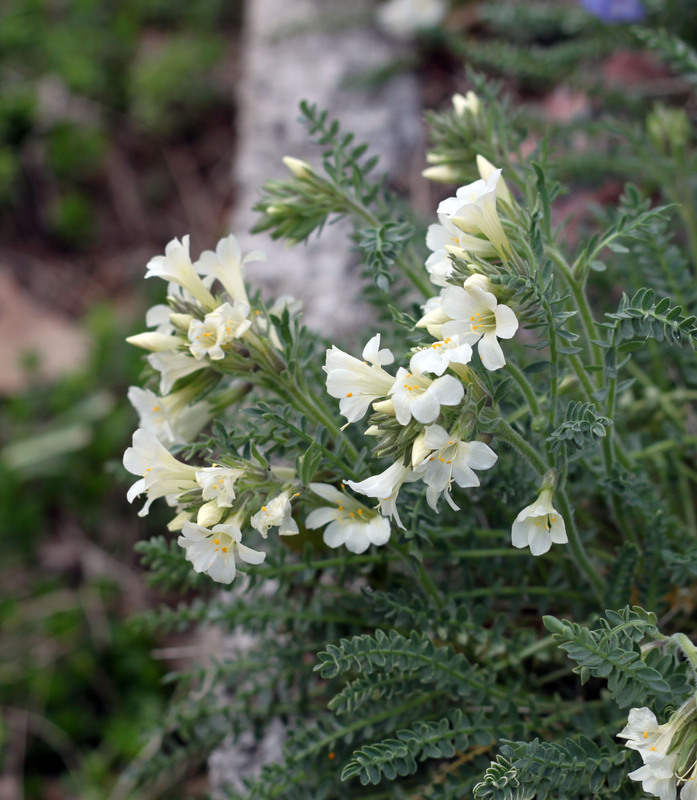 This entry was posted in Uncategorized and tagged Polemonium brandegei, Polemonium viscosum. Bookmark the permalink. I’m fascinated by common names of plants, and the name sky pilot really tickles me. I had not heard of sky pilot. The name is delightful, and your pictures of both of those little polemoniums are too. My son lives in Denver and is trying to cope with the weird spring this year, but I like to come here and read your complaints about it from a gardening point of view. And I always like Chess’s take on things — he cheers me up. The fact of snow in April and May has always been an uncomfortable suggestion that I live in an inferior gardening climate; I’d much rather have rain, of course,and the cold that has accompanied the snow has been very damaging. I’d seen snow in May once in the first 40 years of living here; since 2000, every May but one. The dog completely disagrees with all of this and was so hot on Monday, when it was 80, that I had to set the box fan in the window for him at night. Just discovered your blog and am going to have to read every entry. Maybe next winter, but I will! Thanks. The dog would suggest skipping any that aren’t about him. It’s still winter here, sort of. I will try to make more comments on dog-centric posts. In a sense they’re all dog-centered. I love you polemoniums: they never cease to amaze me with their perennial vigor. You must get the bright yellow mellita type from Kintgen! After about twenty years, they’ve decided to fill the entire trough. Bowed down by hard frost last night. Uh oh, it looks like I have caught up on the blog. It has been most enjoyable reading the archives. See you in the current posts! I’ll start catching up on the archives of the Tootlepedal blog now, another one I discovered in 2013. There are almost 500 posts. Hard to believe. Tootlepedal has some great bird pictures. The Anxious Gardener is nice, too.